I don't really want to go into the details of the Bullet Journal...because it's a LOT. 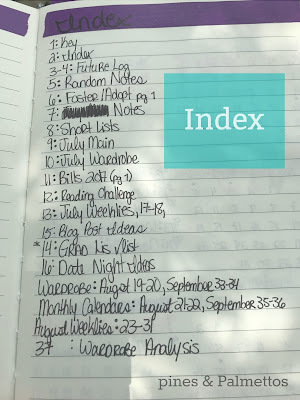 Be careful googling though- I'd recommend going straight to the source at BulletJournal.com. 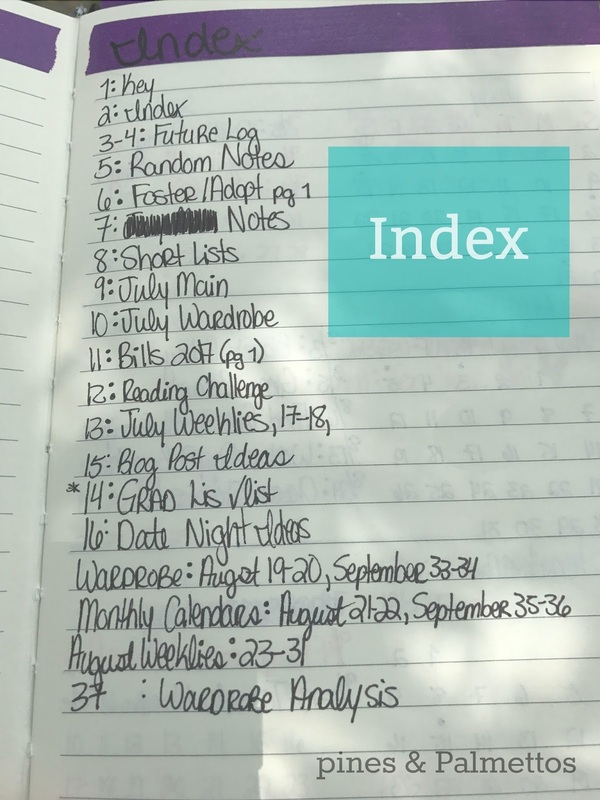 If you look at Pinterest or some of the Facebook groups dedicated to Bullet Journaling, you will see beautiful hand lettering and adorable doodles from people who use it half as a sketch book. Mine is more like the original idea, which is basically a DIY planner. 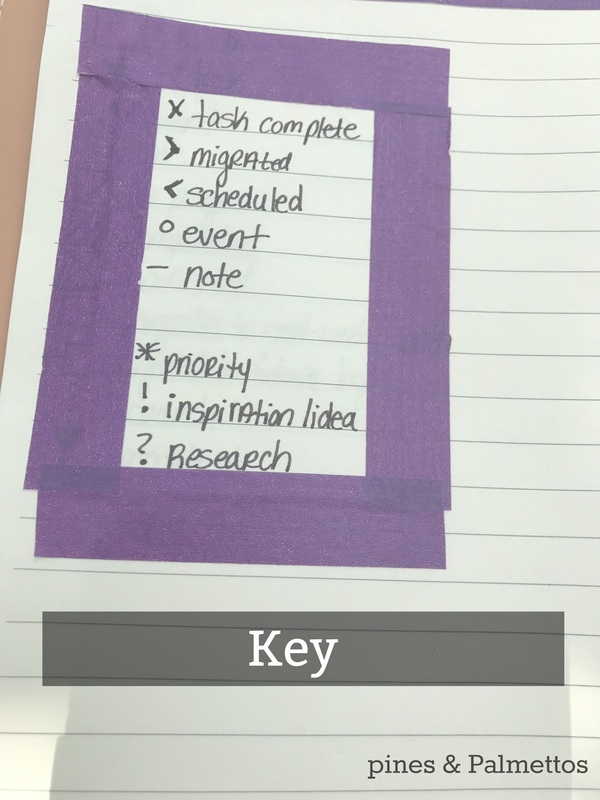 The fast idea behind BuJo is to make really short, fast notes that have tiny symbols to assign categories: tasks, events, notes. You can have "signifiers" to assign priority or indicate more research is needed. 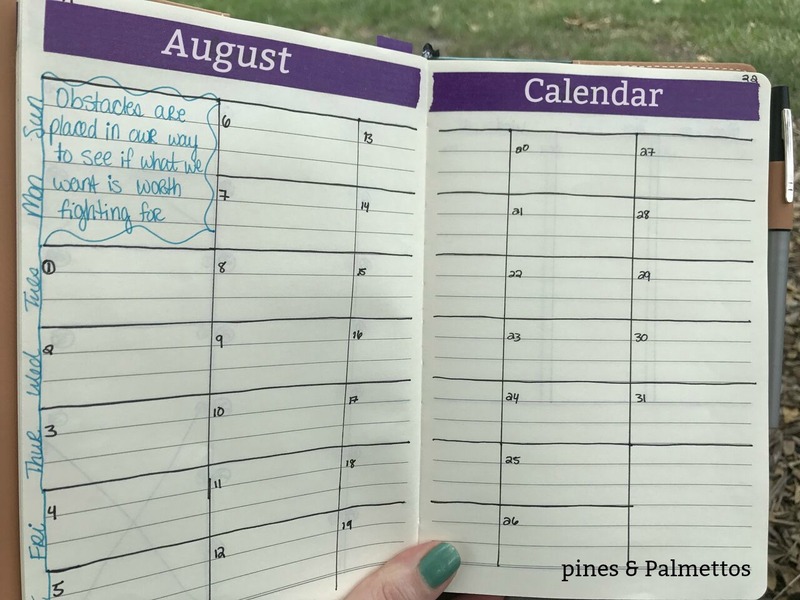 This appealed to me because I really like traditional planners but I always want more "blank" space to write notes- grocery lists, blog post ideas, etc- which aren't tied to a specific day. 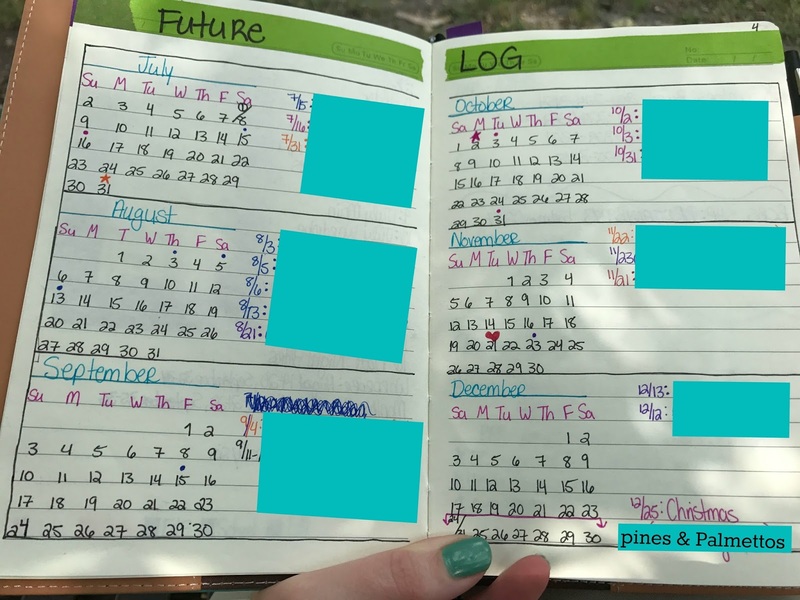 In a traditional planner I would be keeping all those notes on separate days and flipping back and forth...it just doesn't work. 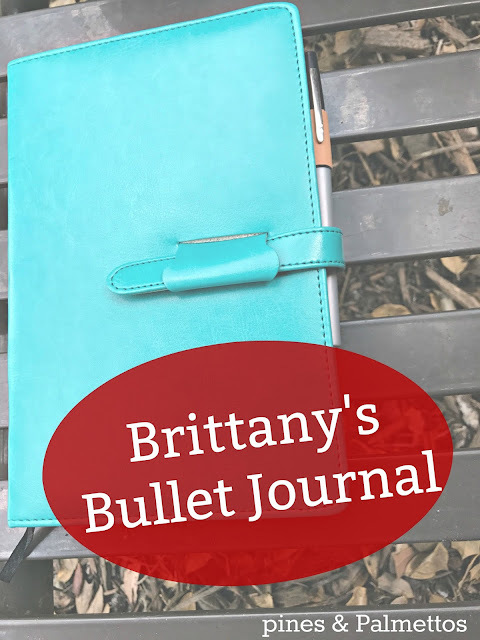 A bullet journal is something that you can customize incredibly easily. The reason I say not to Google at the beginning is because people have really run with this idea. There are hundreds if not thousands of ideas and "layouts" online. Y'all...I don't have the time or talent. So far, everything in my bullet journal is either a list or a calendar. That's it. That's what I need right now. There's also lots of discussion about the best notebook and pens and blah blah blah to use. You could use anything. Since it involves making lines- and is what the creator uses- a lot of people use dotted notebooks or graphed notebooks. But you can totally use a cheap lined one- my current one came from AC Moore & cost 5$. 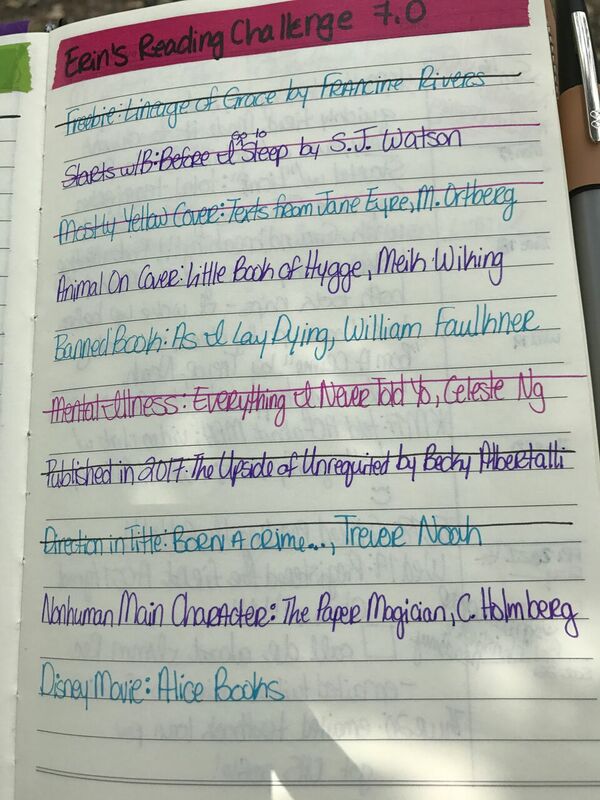 There really isn't an order to the BuJo- you just use a page for whatever you want to. Lists next to calendar next to picture. Whatever. In order to find things, you number pages and put them here in the index so you can find stuff easily (more notes about further down). The idea of indexing is super simple, but for some reason never occured to me before. You can use pre-numbered notebooks or do it yourself as you go along (that's what I do). There are recommended icons/whatever you call the things to signify your categories on the BuJo site, but there are tons of ways to do this (notes v. appointment v. task). I'll be honest, I don't always use this...more often than not I just cross stuff off. But there's the idea. aka 6 month calendar (next time I will probably do a full year, but since I'm starting halfway through 2017 I decided to just do the rest of the year). If you just want to see the details of this month (this is just the outline, before I had added the details). Some people do "dailies." This is a huge aspect of it. The way I have mine laid out, I have a weekly spread but blank space underneath, so I can make notes for individual days without worrying about space- I may have nothing one day and 5 things the next. I want flexibility. This is where I keep a general list of items to buy- if I need to pick up milk, or a birthday card, etc. It's easier to add these to a general list over a week or two versus listing one item every two or three days and flipping through. This way once I have a list big enough to warrant going to the store, I look at one page and get everything I need. I like being able to cross off books as I read them & see my progress. Really the only things I use besides a pen and the notebook is a little ruler ($.50, to help with straight lines) and washi tape. I use the tape for headers, and as kind of a bookmark. I can use different colors to make "tabs" and flip straight to my monthly calendar or this week. Not required, but I like it. My bujo is not particularly pretty. But it works. And I'm sharing it because I go so dang on intimidated when I tried this the first time. You don't have to do cute headers or tons of colors or artistic doodles (if you want to, go for it) but I wanted to show that it's possible to keep it simple and really helpful to get organized. Yes, you can use apps and phones for all this now. And I do still use those (especially things that concern the husband, thanks shared calendars)...but there's something about the act of writing something down. It just helps it stick and makes me feel for more accomplished when I cross it out. I am slightly concerned about having time to write layouts once I start classes, especially since we will be starting classes for the foster/adoption process around the same time. It's going to be a busy fall, y'all. But it's oddly enjoyable for me, and I think if I create my monthly/weekly layouts once a month I can manage it. That's what I did for August, anyway. So we'll see how it goes...maybe I'll update in a month or so. 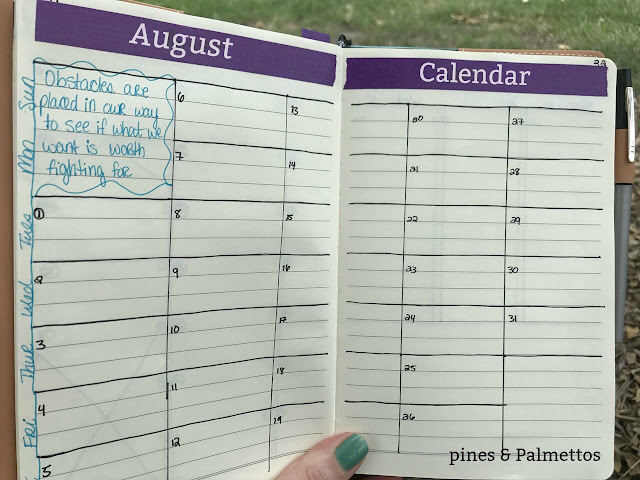 Do you have a planner or system that you enjoy? Anyone else like analog versus just digital? I tried to bite the bullet and couldn't. I got overwhelmed and I'm too indecisive and I wasn't really sure what I needed vs what I was being peer pressured into... I ended up with a moleskin weekly notebook. There's a full year calendar and holidays and international holidays and some other stuff at the beginning which I rarely ever use. The pages are perfect for me. One side is a week layout and the other page is just lined for notes (where I put my to-dos, ideas, groceries). I was also doing a gratitude thing, but I kept forgetting so I just gave it up. YAY for finding things that work.. AND extra YAY for shared Google calendars, without them, I would not function in a relationship. LOL I had to put my contacts in it, too. And when I changed the kitchen sponge. I don't use a key, either - I know my "language" so I didn't think I needed to write it out. 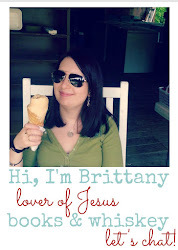 I was sooooo overwhelmed when I started - I think seeing someone else's is key. Thanks for sharing yours! I have a planner/bullet journal hybrid - i use my kikki k planner with dated inserts but i also have a bunch of blank pages with notes/thoughts/stuff i have to do in my planner as well. i found that this system works best for me and i love the flexibility of being able to add/remove pages yet not have to worry about drawing layouts etc for my days/weeks/months.